Last night European stocks closed at their highest level since early January led by the oil & gas sector which rallied 1.2%. The local energy stocks should have the ability to add to Mondays modest gains, but nothing is certain in this choppy market. As most readers will know, Saudi Arabia made a decision in 2014 to pump more oil in an attempt to depress energy prices and subsequently damage the growing US shale gas industry. They did manage to smash the oil price but not the shale industry - again market manipulation fails. Yesterday Russia and Saudi Arabia met to discuss ways of stabilising/increasing the current oil price. They are two of the world’s largest global oil producers, making up around ~40% of supply, which strongly implies that they can influence the short-term price of oil. While the most recent meeting fell short of producing a freeze on output their intentions feel clear - oil closed up 1.6% after surging 4.7% at one stage. We believe the simple implication of Russia and Saudi sitting down with the intention to get oil prices higher is bullish – think back to how far Saudi smashed oil when they wanted it down back in 2014. OPEC have not been a functional Cartel over recent years but the combination of Saudi Arabia, the drivers of OPEC and Russia is a very powerful combination in today's oil pricing framework. Short-term supply may be outstripping demand but we remain bullish oil from the current $US45/barrel area targeting a move back over $US60/barrel. Furthermore, the added potential of M&A will increase if the Oil prices tracks this path given the very low cost of capital – this would further support a sector that has had a very tough couple of years. A very important issue for future prices is the lack of current exploration relative to history with new oil discoveries at a 70-year low. Obviously, the demand profile for Oil is also changing, and the self-sufficiency of the US along with new energy technology obviously has an impact on demand, however probably not to the extent currently being factored in. Depressed prices provide little incentive to bring on new production (other than the stuff that is already being developed) so the likelihood is that today's supply / demand dynamic will change dramatically as lower supply in the next 12-18 months becomes supportive of price. 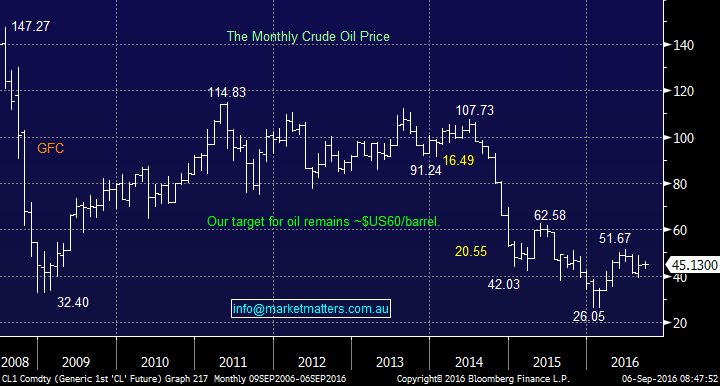 Crude oil is currently trading in a significant Contango with crude oil December 2017 at $US45.17 but 2018 at $US51.49 - a 14% premium. NB. Contango is when the forward / future price of a commodity is trading at a premium to the spot (today's) price. The reverse is called backwardation. Importantly stocks look 1-2 years ahead hence while this Contango is in place we remain optimistic the energy sector over coming months. 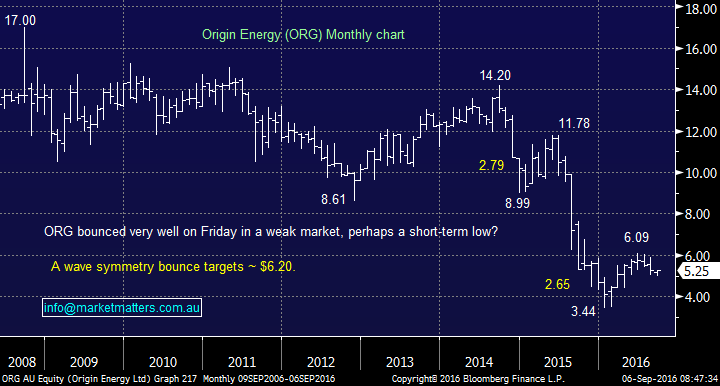 Origin (ORG) - Our first holding in the sector has been weak over the last month since a poor report. While it's clearly frustrating to see a stock drop over 10% after being so close to our profit target we still believe that ORG will reach our $6.20 target area if oil follows our anticipated path. 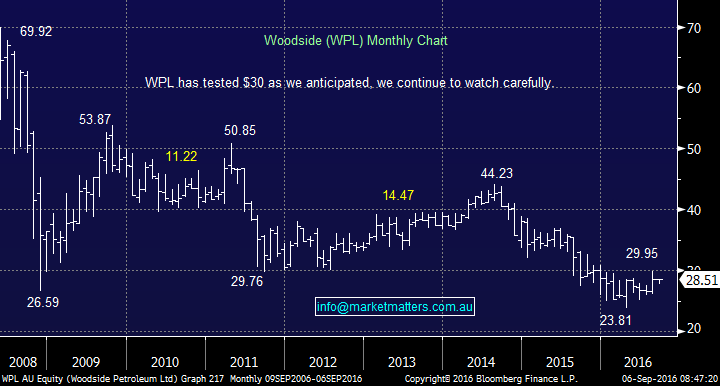 Woodside (WPL) - Our second stock in the sector has performed nicely since our purchase and is showing an 80c profit plus its traded ex-dividend while we held the stock. Our initial target is a retest of $30 from where we will review our exposure. And finally, further M&A cannot be ruled out in the sector with prices still at depressed levels and cash extremely cheap. This week we saw WPL purchase some BHP assets but it was not that long ago that they had an unsuccessful tilt at Oil Search (OSH). We remain comfortable with our energy sector exposure via Origin (ORG) and Woodside (WPL). The Saudi attempt to drive the US tight oil and gas companies out of business may be cannier than it appears on first glance, as the US oil and gas industry has a serious demographic imbalance. A disproportionately large number of US oil professionals were born before 1965, and these workers will be difficult to replace when they retire. As such it is likely that that before the end of this decade the US oil & gas industry will be faced with a significant skills shortage. Saudi Arabia is not faced with the same demographic challenge, and so in this regard it has time on its side. Very interesting comment Patrick, an aspect I doubt many gave consideration.